A sharp, sudden pain in the back of the lower leg may indicate a condition known as tennis leg. It is mainly caused by a severe medial gastrocnemius strain or rupture. The condition is common among tennis players between 40 and 60 years of age, and involves the two major muscles of the calf: the gastrocnemius and the soleus. At one time, the typical tennis leg symptoms of soleus pain, swelling, and walking difficulty were thought to be the result of a plantaris tear. Recent studies have shown that this is a cause in rare instances only. Treatment is deferred to basic rest and ice packs until pain and swelling are reduced. The tennis leg injury requires stretching and exercising of the muscle in slow, steady steps until movement is achieved without discomfort. Tennis leg is a term used for an injury of the calf muscles, specifically rupture of the medial head of the gastrocnemius muscle. The medial head is one of two muscular regions of the muscle, and is attached to the medial side of the femur bone. The other muscular region is known as the lateral head, and together, the gastrocnemius heads allow the leg to flex at the knee and the foot to point down— known as plantarflex of the foot. Tennis leg was first discovered with the injury of a tennis player in 1883, and was thought to involve the rupture of the plantaris tendon. Recent diagnostic studies have found that cases of medial gastrocnemius strain were more frequently involved in causes of tennis leg. The plantaris muscle and plantaris tendon are rarely implicated. In fact, tennis leg is linked not only to the rupture of the medial gastrocnemius muscle, but also to the condition deep vein thrombosis (DVT) and the presence of fluid between the gastrocnemius and soleus calf muscles. DVT develops with a blood clot, or pooling of blood, and accounts for 10% of all tennis leg-related symptoms, according to a Radiology Case Report Journal study published in 2016. A tennis leg injury is seen when a movement of the leg causes the gastrocnemius muscle to contract while the leg is straightened. This action, called “cutting,” is often performed by tennis players who have their back leg extended during play. It places forceful weight on the gastrocnemius muscle while the knee is extended and the ankle is flexed with the foot in an upward position. Symptoms of tennis leg include pain, swelling, and palpitation of the gastrocnemius muscle region, and a popping sound is often heard with the impact of the injury. It can also be seen with other physical activities, such as soccer, football, or track and field sports, that employ a force causing the ankle to plantarflex, sending the foot pointing downwards. A medial calf injury is common among the middle-aged, as physical activity seems to dwindle with time. People tend to spend more time participating in intense activities on a regular basis in their youth. Over time, the once strong muscles begin to lose flexibility and are susceptible to injury with high-impact movements, such as tennis positions. These individuals are often deemed “weekend warriors,” as they infrequently use the gastrocnemius muscle with such force as they did before. Rupture of the medial head of the gastrocnemius muscle has been linked to both unconditioned muscles and improper stretching of muscles before an activity. This theory does not apply to athletes who may have a tennis leg injury after completing a thorough stretch regimen. These cases may relate to a possible relationship between flexibility or elasticity of the muscle fibers and the degree of force placed on the gastrocnemius muscle. A high-impact force may cause the elasticity of the fibers to react. Once a professional or recreational athlete suffers tennis leg trauma, possible scarring of the fiber tissues may not properly absorb shock. This can lead to a recurrence of injury. It is vital to recognize tennis leg symptoms, because they can mimic those of other conditions such as DVT. The first step in tennis leg treatment is to begin the P.R.I.C.E. treatment plan. This method entails protection, rest, ice, compression, and elevation. Protect the calf muscles by avoiding activities that require stretching, pulling, or placement of weight on the muscles. Crutches or other walking aids may be required until full weight is tolerated without pain. Rest also comes in the form of protection by resting the leg and avoiding the use of calf muscles. Ice packs or compresses should be applied to the calf muscle immediately following an injury. For the next 24 to 48 hours, the ice should be placed for 10- to 15-minute treatments. Once the swelling, pain, and other symptoms begin to disappear, reduce timing of ice packs. Compression with the use of compression bandage around the leg will reduce swelling and protect the joint at the knee. Elevate the affected leg to allow the swelling to go down and promote proper blood circulation. After 48 hours, begin stretching and moving the affected leg with gentle exercises. There should be no pain associated with any of the movements. For best results, follow a strength-training plan for a tennis leg injury. If you experience pain at any time during any exercise or stretch, rest is recommended. Begin walking and placing weight on the foot. If only partial weight can be tolerated, use a crutch to balance while walking. Use a heel lift in both shoes to alleviate weight load on calf muscles. The lift should act as a shock absorber. Stretch the long calf muscles by stepping forward with the non-injured leg, with the heel of the back leg flat on the floor and the knee straight. Move weight from the back to the front leg while pressing the back heel firmly onto the floor. Hold stretch of upper calf for 15 to 20 seconds before releasing. Repeat three times with a 10 to 20-second rest period between sets. Stretch the short calf muscles by stepping forward with the non-injured leg, with the heel of the back leg flat and the knee bent. This allows stretching of the lower calf. Repeat hold and stretch for 15 to 20 seconds, release, and repeat three times with 10 to 15 seconds between stretches. Strengthen the foot muscles by moving the foot of the affected leg in the air, rotating the ankle. Increase foot strength by folding a towel that is on the floor with only the toes. Work at this for 15 to 20 seconds. Repeat up to 20 times with a resting period of 10 to 20 seconds between attempts. Perform swimming and cycling exercises to promote blood circulation to the calf while avoiding extra pressure on the muscles. At this point, walking and exercising can be performed with no pain or discomfort. This is the time strength training can be taken to the next step. Strengthen calf muscles by rising onto the toes of both feet at the same time and holding position for 10 to 20 seconds. Lower the heels and soles of feet and repeat. Work to perform on one leg at a time. Walk on the spot with quick but gentle step movements. Work the way up to jogging with easy jogs, sprints, and running in straight lines. Incorporate quick stops, starts, and turns into the jogging movement. Begin adding jumping exercises to routine workout. This is where the fun returns by performing tennis movements. Begin with playing in close proximately to a wall or a partner and slowly add feet in distance. Practice volleying the ball with a partner or against a wall. Start performing distance exercises or movements. Add techniques such as low volleys and overhead serves. When you can smash hit the tennis ball while moving about the court with no pain or discomfort, it may be time for a practice match. A two-week period of practice matches with no problems is call for a return to the court for real matches. Follow a strict build-up strengthening regimen to ensure healing is complete before performing moves affecting calf muscles. Do warm-up and cool-down stretches and exercises for 10- to 15-minute periods with each tennis match, or similar physical activity. Wear proper footwear with shock absorbers, comfortable fit, and good gripping ability. Stop play if muscles feel tight, and massage stiff muscles. Wear proper clothing in relation to the weather. Cold weather can make calf muscles tense up and constrict, resulting in poor reaction of muscle fibers. Incorporate calf strengthening in workouts with steps, running, and cycling. 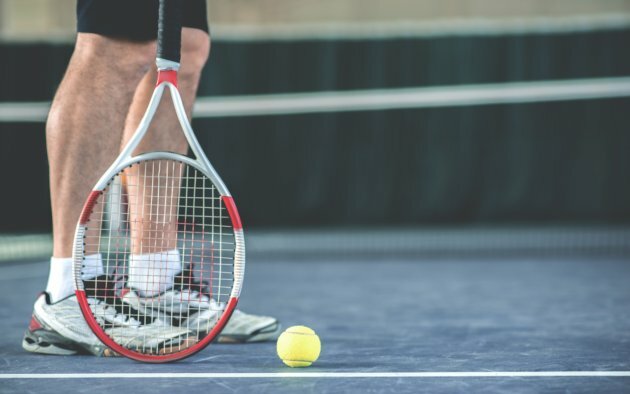 Tennis leg may be a common injury among tennis players and other athletes, but it can produce debilitating pain and the inability to walk in anyone. Any action where leg extension is met with a forceful push-off of the foot and ankle base can result in rupture of the medial head of the gastrocnemius muscle. Such an injury to the largest calf muscle may be met with damage that requires weeks of gradual rebuilding of the strength of the muscle fibers. With time, practice, and patience, an athlete can return to their favorite sport. Saglimbeni, A.,“Medial Gastrocnemius Strain,” Medscape, November 7, 2016; http://emedicine.medscape.com/article/91687-overview, last accessed August 22, 2017. Harwin, J., et al., “’Tennis leg’: gastrocnemius injury is a far more common cause than plantaris rupture,” Radiology Case Reports Journal, March 2017; 12(1): 120–123; https://www.ncbi.nlm.nih.gov/pmc/articles/PMC5310238/, last accessed August 22, 2017. “Tennis Leg,” Physiotherapy-treatment; http://www.physiotherapy-treatment.com/tennis-leg.html, last accessed August 22, 2017. “Tennis Leg,” Sports Injury Clinic; http://www.sportsinjuryclinic.net/sport-injuries/ankle-achilles-shin-pain/tennis-leg, last accessed August 22, 2017. “Calf Muscle Strain,” ITF Tennis; http://www.itftennis.com/scienceandmedicine/injury-clinic/tennis-injuries/calf-muscle.aspx, last accessed August 22, 2017. Miller, M., Essential Orthopaedics (Philadelphia: Saunders, 2010), 687. Yu, J. and Garrett, W., “Ruptures of the Gastrocnemius Muscle (‘Tennis Leg’),”The Achilles Tendon: Treatment and Rehabilitation (Springer Science + Business Media, LLC: New York, 2009) ,35.